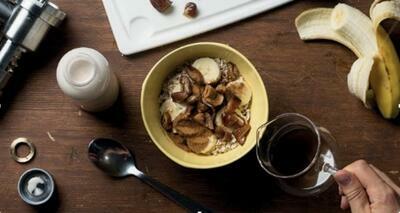 Want something different and healthy for breakfast? In minutes you can prepare a really tasty breakfast from fresh oatmeal and oil. This recipe is fast and easy, and you can modify it with different fruits, milks, and sweeteners. 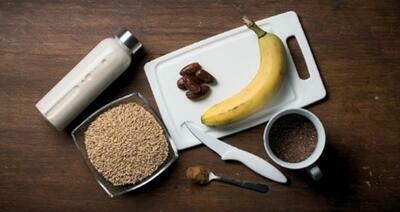 We kept it simple and healthy using dates and bananas for sweetness. You can even make your own fresh almond milk with your juicer if you want the ultimate fresh breakfast. It's great with fresh blueberries or raspberries, and if you like something sweeter you can substitue maple syrup for the dates. 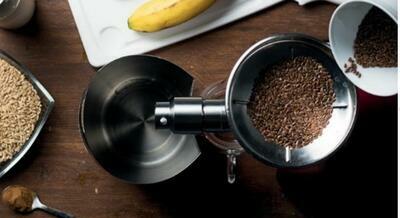 Pour all the flax seeds into the hopper. Set aside the fresh flaxseed oil. 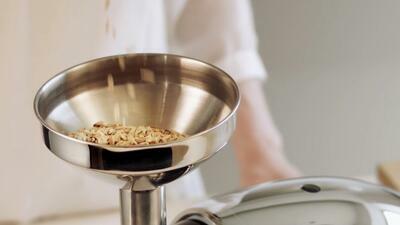 Place a bowl under the oil outlet and pour oats into the hopper. Note that raw oatmeal has a stronger and more distinctive flavor than store-bought oatmeal. If you prefer, you can steam them or soak them overnight before processing for a milder flavor. 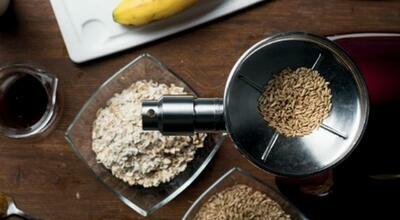 Add the banana slices, dates, cinnamon, and fresh flaxseed oil to the oats. Pour the almond milk over the mixture. Enjoy!